Introduction: Recurrent complaints of abdominal pain, bloating and dysphagia are problematic in the post-operative period following laparoscopic paraesophageal hernia repair and often lead to radiologic evaluation or intervention. While the majority of patients do well, recurrence of symptoms or other complaints in the postoperative period can be challenging. The purpose of this study is to determine if patient or operative variables can be used to predict the need for radiologic evaluation, re-admission, endoscopy or re-operation following laparoscopic paraesophageal hernia repair. Methods: A retrospective review of patients undergoing laparoscopic repair of paraesophageal hernias was conducted from December 2008-June 2010 at a single institution. Data collected included patient factors (age, body mass index (BMI), co-morbidities, acute vs. chronic presentation and any prior repairs) and operative factors (use of gastrostomy tube, length of operation, use of mesh, bougie size). 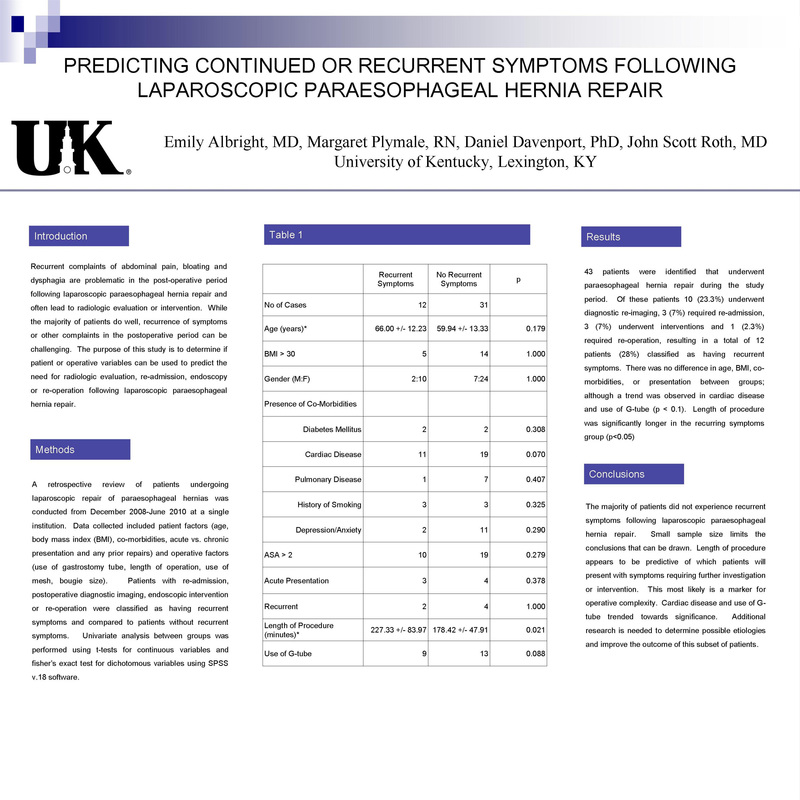 Patients with re-admission, postoperative diagnostic imaging, endoscopic intervention or re-operation were classified as having recurrent symptoms and compared to patients without recurrent symptoms. Univariate analysis between groups was performed using t-tests for continuous variables and fisher’s exact test for dichotomous variables using SPSS v.18 software. Results: 43 patients were identified that underwent paraesophageal hernia repair during the study period. Of these patients 10 (23.3%) underwent diagnostic re-imaging, 3 (7%) required re-admission, 3 (7%) underwent interventions and 1 (2.3%) required re-operation, resulting in a total of 12 patients (28%) classified as having recurrent symptoms. There was no difference in age, BMI, co-morbidities, or presentation between groups; although a trend was observed in cardiac disease and use of G-tube (p < 0.1). Length of procedure was significantly longer in the recurrent symptoms group (p<0.05). * These data are represented by mean ± standard deviation. Conclusions: The majority of patients did not experience recurrent symptoms following laparoscopic paraesophageal hernia repair. Small sample size limits the conclusions that can be drawn. Length of procedure appears to be predictive of which patients will present with symptoms requiring further investigation or intervention. This most likely is a marker for operative complexity. Cardiac disease and use of G-tube trended towards significance. Additional research is needed to determine possible etiologies and improve the outcome of this subset of patients.